I don't know what has gotten into me, but I am totally cheating on all the other colors in my closet with my cobalt blue pieces. Maybe it is due to my newly red hair that all things blue are yelling, "wear me! wear me!" every morning when I get dressed. Whatever it is, I am digging it! What colors have you been crushing on lately? Any unexpected color-pairings making it into your outfits? amazing outfit dear! love the dress! LOVE that outfit! You look absolutely amazing and that combo is perfect! 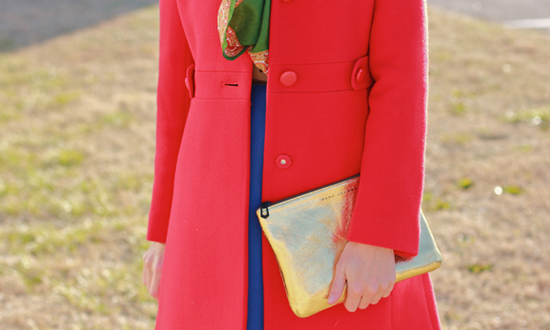 Am am totally loving this primary color look! And the sunlight highlighting your new hair...perfect! I LOVE this dress! LOVE. You look so gorgeous. And I love that coat. I love these colors together. And that scarf is pretty amazing. This might be one of my favorite outfits of yours! You KNOW red is my fave. I think you should send your sis that coat. Cobalt is one of my fav colors to wear too! You look gorgeous! You already HAVE the Blue one! Back off lady! haha. But seriously I scored this coat from a J.Crew super sale a few years back - I think it was originally $250 and I got it for under $100... deals deals deals! People have told me that when I wear my hair with a center part, I really change the way my face looks.... could that be it? You look stunning in this dress! I love how you mixed the cobalt with cognac and black - so chic :) I have a similar cobalt dress that I'm absolutely smitten with, but I've only paired it with black so far. I'm going to have to venture out and wear it with my brown boots for once!! This is definitely a great dress and color on you. I'd be crushing on cobalt too if I had this dress- it's too good to pass up! Love it! The first picture is one of my favorites of you, the sun makes it have such a cool effect! 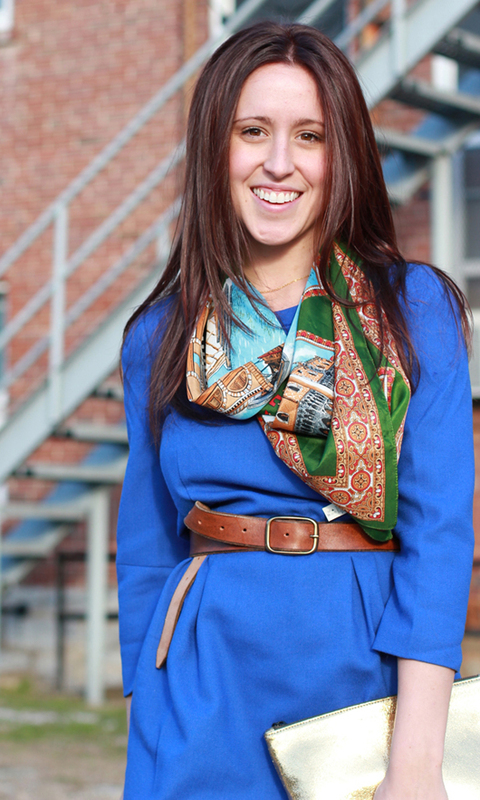 Love the cobalt, especially with that scarf. I've also has a recent love affair with cobalt blue. There is something about the color tat makes me feel empowered? I don't know, but I do know it also makes me eyes pop. You look so pretty in these photos! I also spy a tripod! I need one of those.. and obsessed with that clutch! Yes my tripod is my BFF! We go out and stand in abandoned parking lots all the time together! It is a powerful color, I agree! Thank you dear! I have mad love for the "golden hour"
thank you thank you! I am still learning what look best, and what make my subtle hair color shine! Thank you dear! It was one of those magical days when the first things I put on where what I actually left the house in, and felt good about all day! Oh it's the dress from yesterday's post! I love it on you. I am definitely mint green obsessed (like the rest of the world, even though I was already obsessed with it). This outfit is so fabulous with and without the coat. Fabulous look! That dress looks great on you! I'm super crushing on cobalt blue lately too. It's so pretty! And my post today pairs red and navy too :) Such a fun combo sometimes! Loving the cobalt! And loving you altogether .... you seriously get more gorgeous in every post! 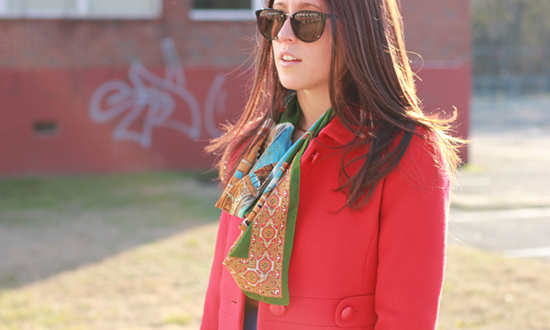 Nice look pairing the cobalt and red together! This outfit is truly amazing! Very classicly beautiful. 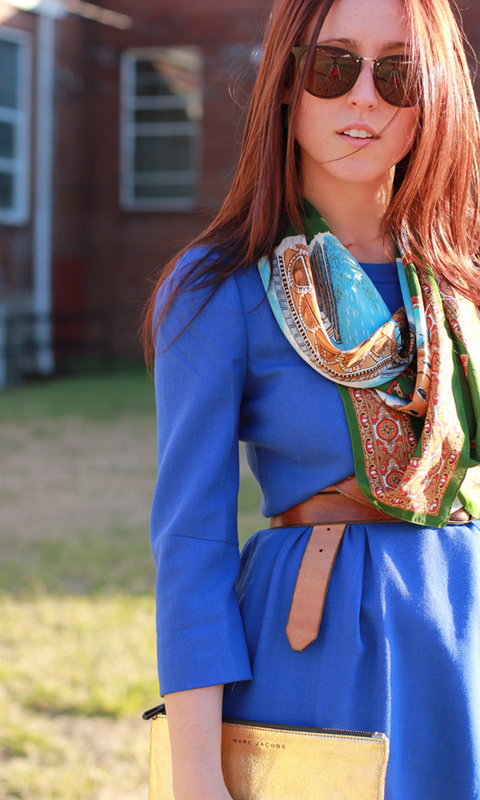 Love the scarf, it adds to perfect touch. You look amazing absolutely love. OH MY GOSH i am obsessed with this dress!! 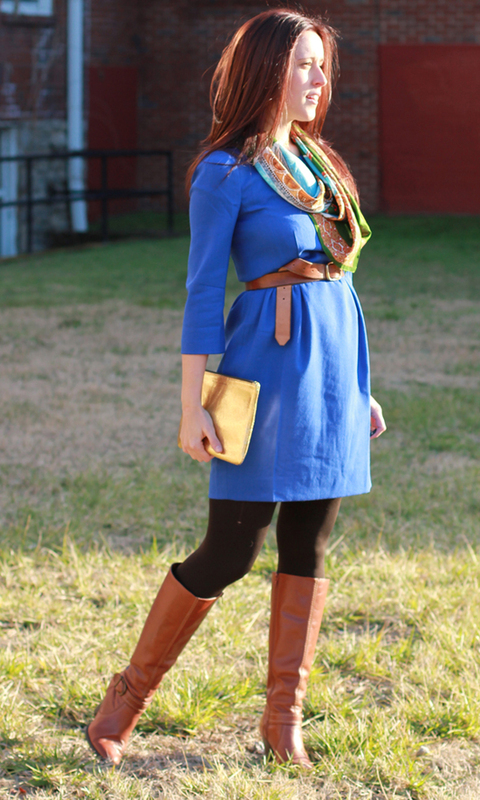 Love it with the scarf and boots.